Thousands of tourists remain stuck on Indonesia’s island of Bali after its airport was closed for a second day due to hazards created by clouds of ash from an erupting volcano. The word “cancelled” lit up every slot on large flight information boards at the Ngurah Rai International Airport. Some passengers stood in line at help desks hoping for more information, while others sat waiting patiently. Mount Agung, which has a history of violent eruptions, began waking up two months ago and prompted mass evacuations near the mountain. Its last major eruption in 1963 killed about 1,100 people. Indonesia’s disaster mitigation agency says the airport on the tourist island of Bali is closed for a second day due to the threat from volcanic ash. Mount Agung in the northeast of the island, about 70 kilometers (43 miles) from the airport, has continued erupting Tuesday, sending plumes of smoke and ash about 3,000 meters (9,800 feet) above the crater. Agency spokesman Sutopo Purwo Nugroho said the airport closure is in effect until 7 a.m. Wednesday. He said the airport on neighboring Lombok has reopened after being closed on Monday night. More than 400 flights were canceled and nearly 60,000 passengers stranded Monday on the first day of its closure. Ash from Bali’s volcano is disrupting life on parts of the tourist island that are outside the immediate danger zone. At Buana Giri village, some residents said they were leaving because the area is now inhospitable for their livestock. Villager Made Kerta Kartika said ash has covered the area since Sunday and made farming difficult. The eruption of Mount Agung has forced the closure of the island’s airport and authorities have ordered 100,000 people to evacuate from areas close to the volcano. China says there were 17,000 Chinese tourists on Bali before the latest eruption of Mount Agung. The Chinese consulate on the Indonesian island said on its website that airlines and travel services were arranging 100 buses to take tourists to catch ferries to neighboring Java. The Chinese foreign ministry issued a statement urging travelers to be “vigilant about safety” when deciding whether to visit Bali. China Eastern Airlines, one of the country’s biggest carriers, canceled flights Sunday and said passengers due to fly any time between then and Dec. 10 could obtain refunds. The closure of Bali’s airport due to volcanic ash is having a disruptive effect on flights around Indonesia and the region. Bali is a hub airport in Indonesia with many flights transiting there for domestic as well as international destinations. Planes that would have flown other routes Monday are now stuck on the tarmac in Bali. Human Rights Watch Indonesia researcher Andreas Harsono said he was waiting two hours at Jakarta’s terminal 3 for his delayed flight to a domestic destination. He said other flight delays have been announced at the terminal, which serves national carrier Garuda, and the departure area is filling up with many waiting passengers. Volcanologists say the lava’s presence is sometimes reflected in the ash plume which takes on a reddish-orange glow even in daytime. Agency spokesman Sutopo Purwo Nugroho said bigger eruptions than those currently happening are possible based on the information the disaster agency is receiving from the volcano monitoring center. Nugroho said officials are responding based on a worst-case scenario occurring because Agung has a history of violent eruptions. Its last major eruption in 1963 killed about 1,100 people. Indonesia’s Disaster Mitigation Agency says as many as 100,000 villagers need to leave the expanded danger zone around the Mount Agung volcano on Bali, but that less than half that number have left. 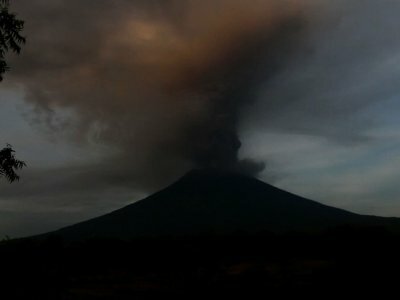 The volcano’s alert was raised to the highest level earlier Monday and ash clouds have forced the closure of Bali’s international airport. Nugroho said about 40,000 people have evacuated but others have not left because they feel safe or don’t want to abandon their livestock. Indonesia’s Directorate General of Land Transportation says 100 buses are being deployed to Bali’s international airport and to ferry terminals to help travelers stranded by the eruption of Mount Agung. Bali’s international airport was closed early Monday after ash from the volcano reached its airspace. Hundreds of flights were canceled and tens of thousands of travelers affected. The agency’s chief, Budi, said major ferry crossing points have been advised to prepare for a surge in passengers and vehicles. Stranded tourists could leave Bali by taking a ferry to neighboring Java and then travel by land to the nearest airports.